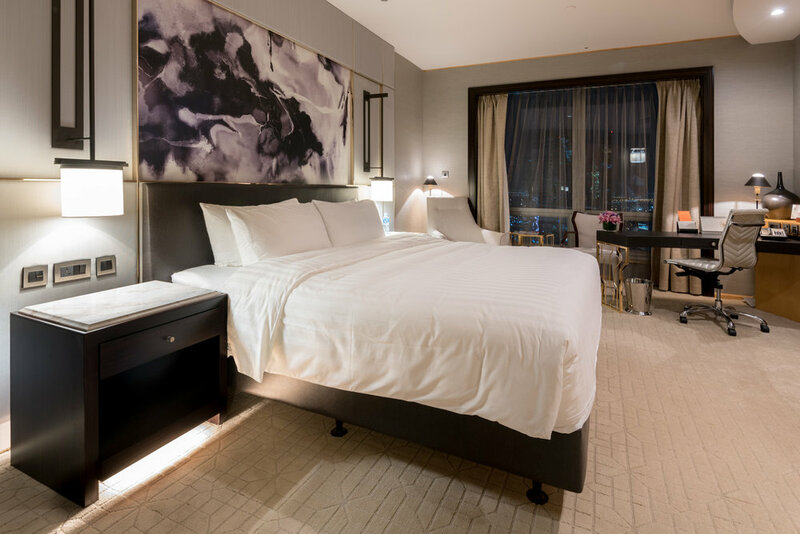 With its stunning rooftop views of Downtown Dubai and the famous Burj Khalifa, the Shangri-La Hotel is a stunning mixture of sophistication and modern influence. 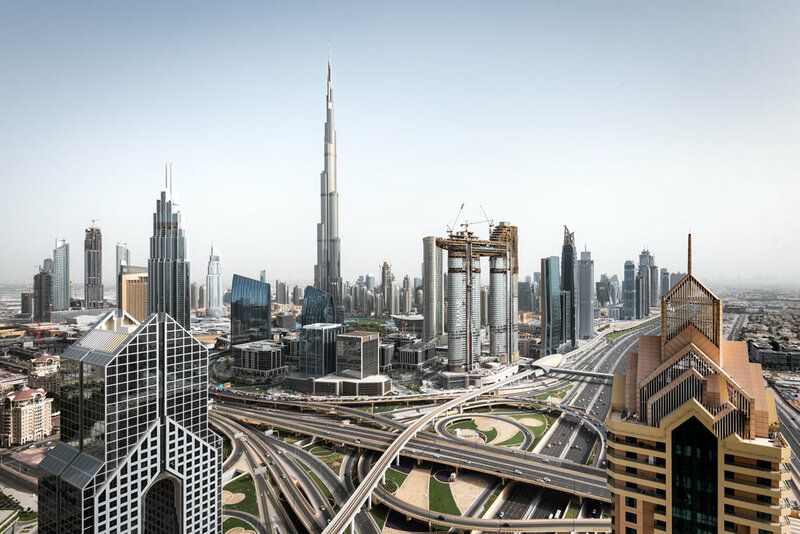 Downtown Dubai is where the majority of the city’s most famous attractions can be found, and it is also the beating heart of its economy. High end hotels, international banks and swanky apartments all coexist in the neighborhood’s many glass towers. 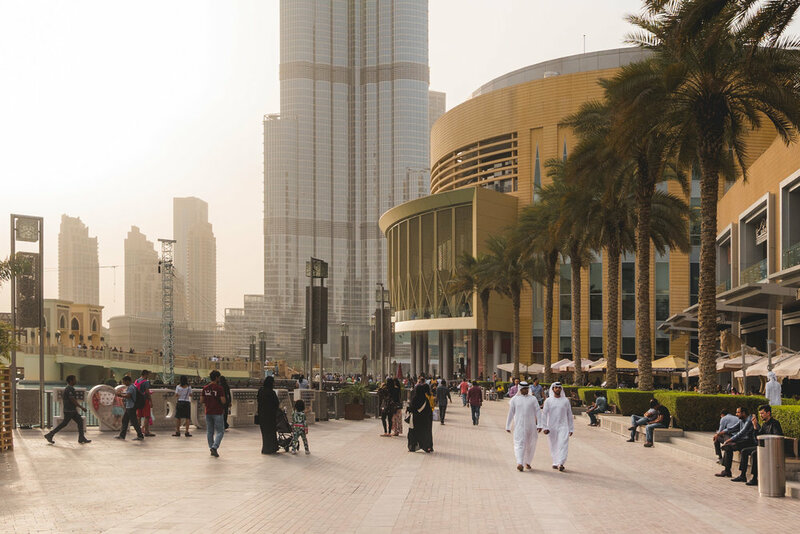 We were there to see what the Middle East’s most forward looking city had to offer, and we wanted to be close to all the action...and we wanted to stay in one of those beautiful tall towers. The Shangri-La Hotel, Dubai is right in center of Downtown Dubai, almost directly in front of the Burj Khalifa, so the views are endless and definitely worth a look. Every inch of it feels sleek and elegant. 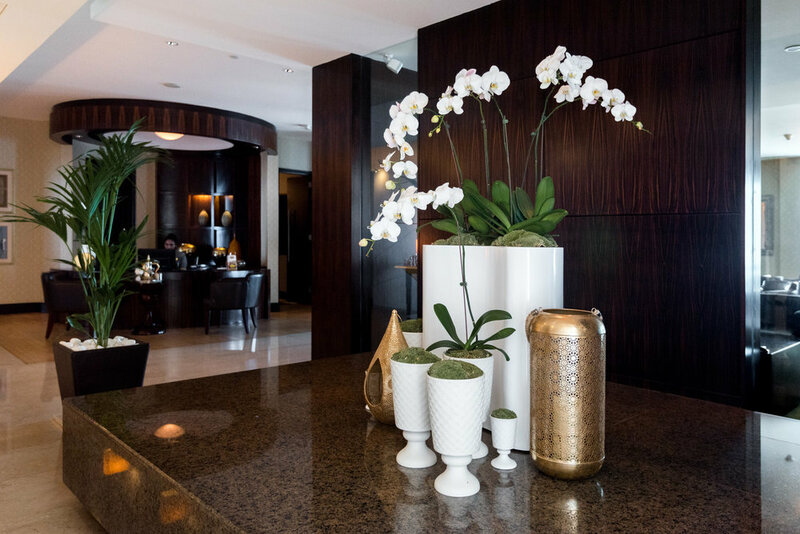 The beautiful patterned and polished floors and smooth stone pillars throughout the building make it feel shiny and modern, while the balconied mezzanine walkways of the upper levels curve gracefully in and out above the lobby. All Shangri-La Hotels possess a dramatic chandelier, and this might just be my favorite one yet! 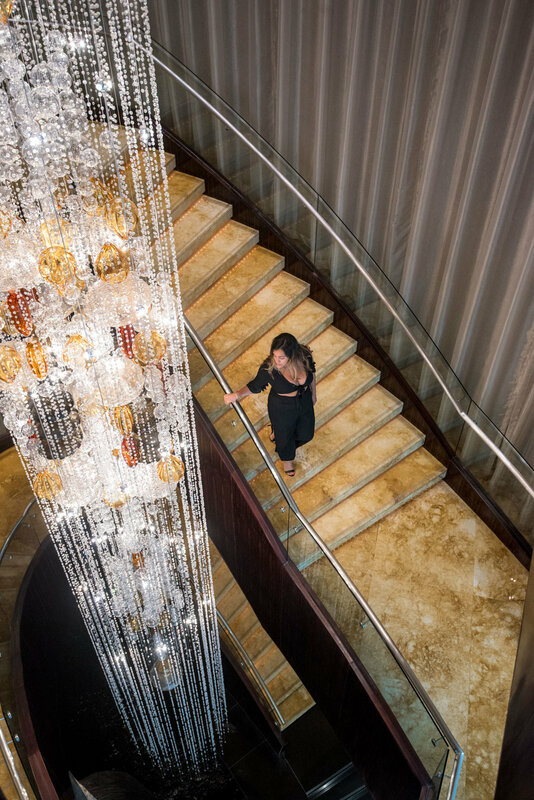 It dangles down like a pillar, descending several floors, while a staircase wraps around it giving you no choice to but to admire it from all its angles as you make your way up to your room. The room itself was nice and comfortable, and it was tastefully decorated with dark wood fixtures and soothing cream carpets, walls and fabrics. We were in one of the Horizon Club deluxe rooms which has enough room for a couple to relax in, but was slightly cramped for the three of us. We would probably opt for one of the larger rooms in the future if we were staying for more than a couple of days. Being in the Horizon Club did give us access to more space however, in the form of the club lounge. Located on the top floor, the lounge was welcome sanctuary from the hustle and bustle of the city. While a little smaller than some of the other Shangri-La Horizon Club lounges we have been in, it was cozy and comfortable. Best of all was the rooftop pool which, due to its exclusivity, was far less crowded than the main pool. The pool itself is indoors, but it still offers fantastic views over the city through the floor to ceiling windows that wrap around it. 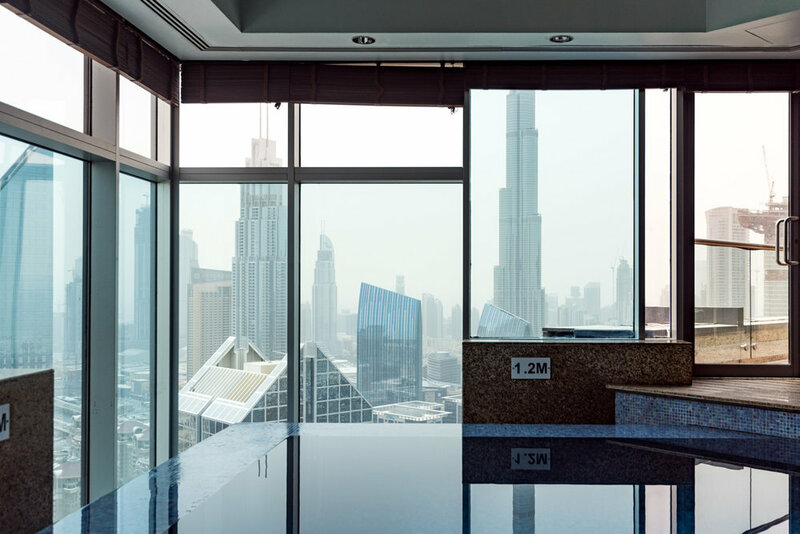 However, for an unforgettable experience, venture out to the balconies on 41st floor to take in some of the best views of Dubai’s downtown (and the Burj Khalifa) in the whole city. If you are looking to take some stunning photos then this is the place to go! Shangri-La is also the place to go if you like to eat well. 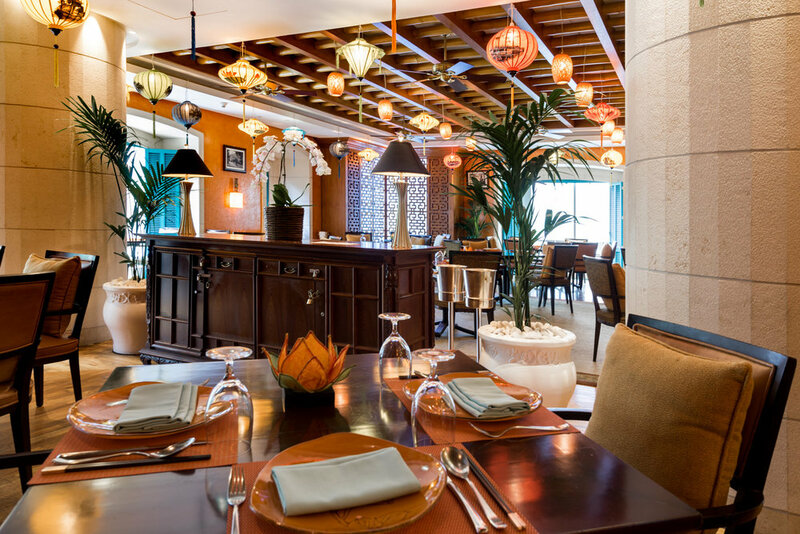 It has six different dining establishments– three restaurants and three lounges. 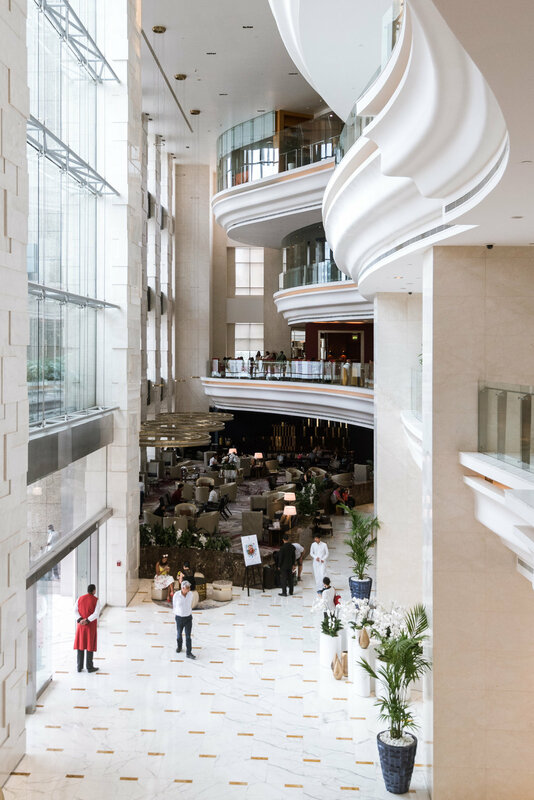 The restaurants offer everything from Chinese at Shang Palace to gourmet Western at Dunes Café, while a variety of lighter snacks can be ordered at the hotel’s lounges and bars. Breakfast consists of a Middle Eastern buffet complete with hummus, falafel and halloumi (all my favorites) and all the usual western dishes. Everything can also be ordered through room service, which I highly recommend to do one night. After a long day of sightseeing and we spent a great evening enjoying Indian food in our room. Eating curries in bed while wearing bathrobes is a night well spent in my book! There are no bad dining options, but the highlight is without doubt Hoi An – Shangri-La’s Vietnamese restaurant. I cannot emphasize enough how delicious the food there is. We ordered as much as we could and absolutely everything was spectacular. Choose whatever grabs your attention on the menu, and no matter what you go for you won’t be disappointed. I will recommend one thing however – the spring rolls – which are brought out and rolled up at your table. Dubai is so hot that most people avoid walking more than a few minutes. It is also such a modern city that it is not really designed for pedestrians and most of its attractions are indoors where air conditioning makes things more tolerable. Driving or using Uber is the way to go here. We recommend a trip to The Dubai Mall whether you plan to go shopping or not. It is much more than just a shopping center, as the enormous complex is packed full of everything from an aquarium to one of the world’s largest video game arcades (besides its over 1200 shops). There are water fountain shows, cinemas and scores of restaurants. All this is hosted in a beautifully designed and decorated space. Shangri-La runs a free hourly shuttle bus, so you can get there without having to brave the heat. 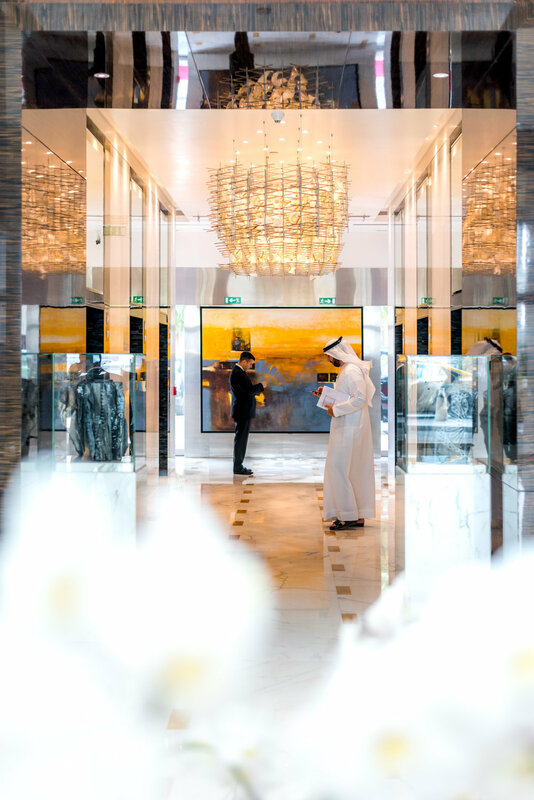 If you've had your fill of shopping, head to the Marina District and Jumeirah Beach to experience the city’s trendy side and to enjoy its white sand beach. Then visit the old town for a taste of the region’s traditional architecture, and to get a sense of what Dubai looked like just a few decades ago when it was just a sleepy backwater. If you have enough time, get out into the desert and witness a unique landscape. If you are the thrill-seeking type, you can go out in a 4x4 and use the sand dunes as stunt ramps. 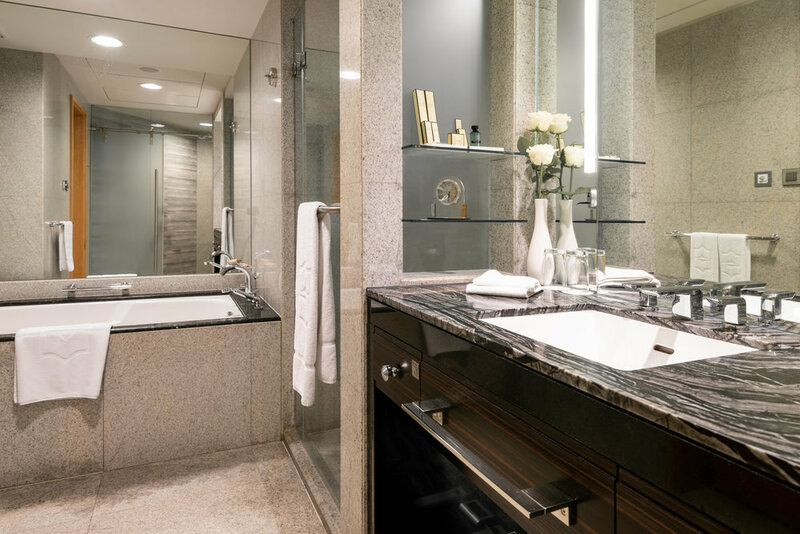 You will find almost everything you need within the hotel itself. Besides the restaurants and bars, there are a couple of shops, a gym and a spa. There is also a laundry service and a car hire desk, as well as a set of meeting rooms for business travelers. While the fact that it is up on the top floor gives the pool in the Horizon Lounge the edge in terms of views, the main swimming pool is still extremely picturesque. 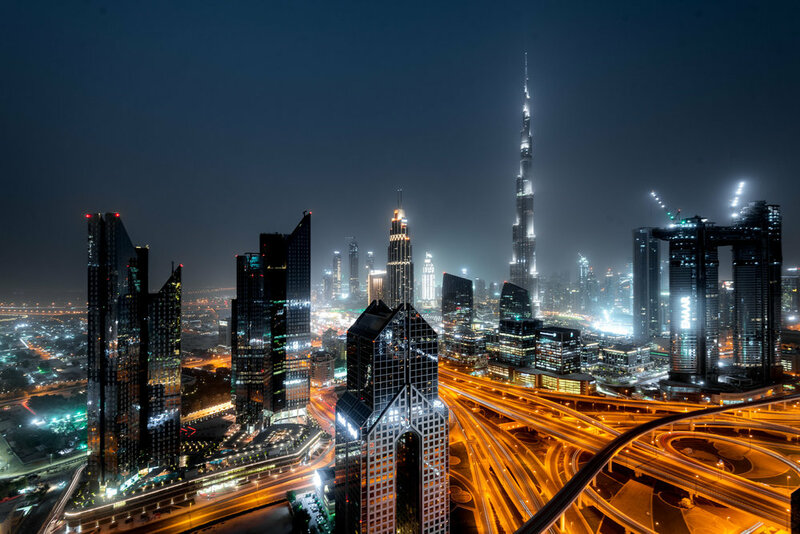 It is framed by the skyscrapers of Dubai’s skyline, and the mammoth Burj Khalifa sits perfectly in the middle of the scene, dominating everything else. The Shangri-La brand has yet to let us down, and once again it delivered. This is a beautiful hotel equipped with everything you need, and food lovers like us are especially well catered for. It would suit a family on a two week vacation just as well as someone on a business stop over thanks to its facilities, location and style.